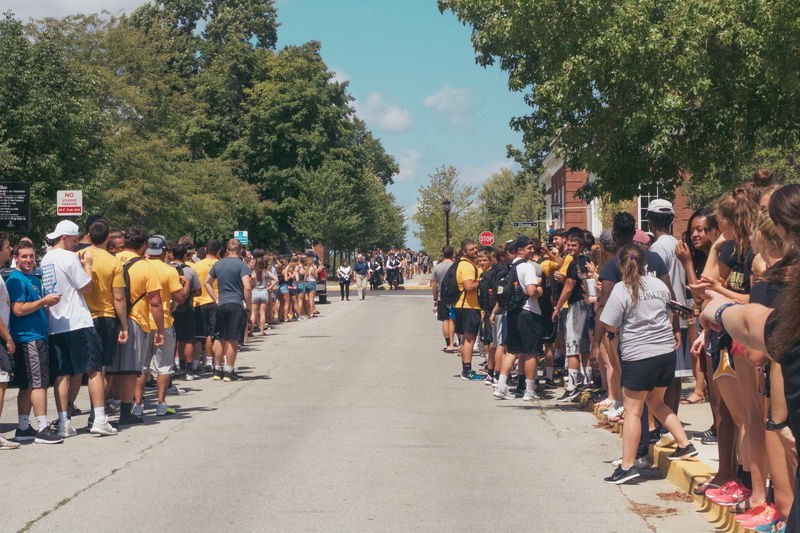 Members of DePauw University class of 2021 and their families arrived in Greencastle on Aug 18 as part of first-year orientation, campus-wide procession, and opening convocation. New students gather in the Ubben Quad and begin a to walk around DePauw’s campus accompanied by bagpipes. 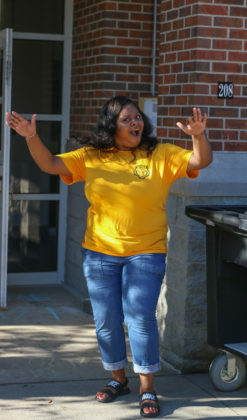 The Procession route goes down Anderson Street, past East College, and into the Green Center of Performing Arts College Avenue entrance. 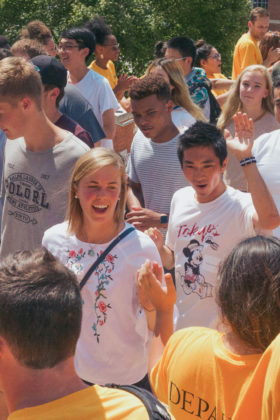 Upperclassman traditionally line the procession route and cheer for the incoming first-year class. 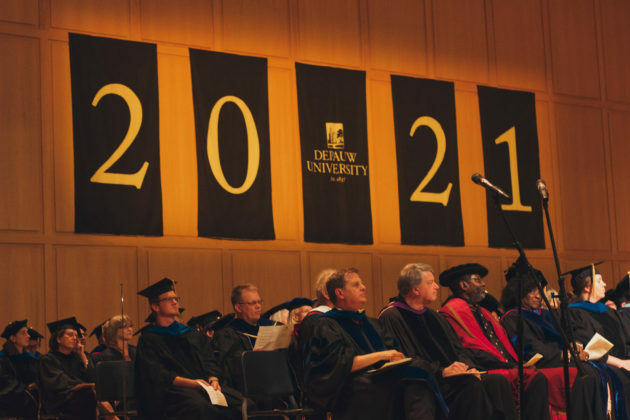 Students are lead into Kresge Auditorium in the Green Center where faculty, DePauw alumni, and student leaders address the incoming class and welcome them to DePauw. 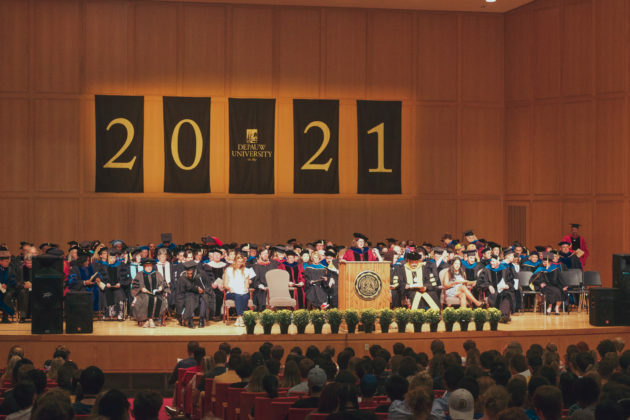 Speakers at Friday’s convocation included DePauw University President, Mark McCoy, Vice President of Academic Affairs, Anne Harris, and DePauw Student Government student body president, senior Erika Killion. The photos in this featured gallery were captured on Aug. 18 and showcase the events of the day for first-year students. 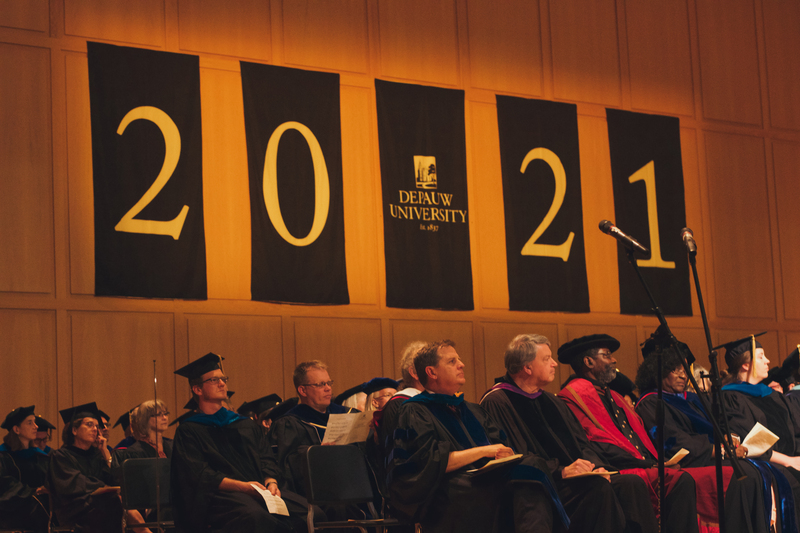 DePauw University faculty wait for the first-year class of 2021 in annual opening convocation program. Photo courtesy of Natalie Brunini. First year class of 2021 walk in opening processional to convocational. 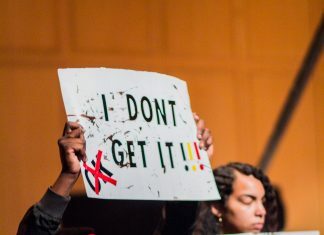 Photo by Natalie Brunini. 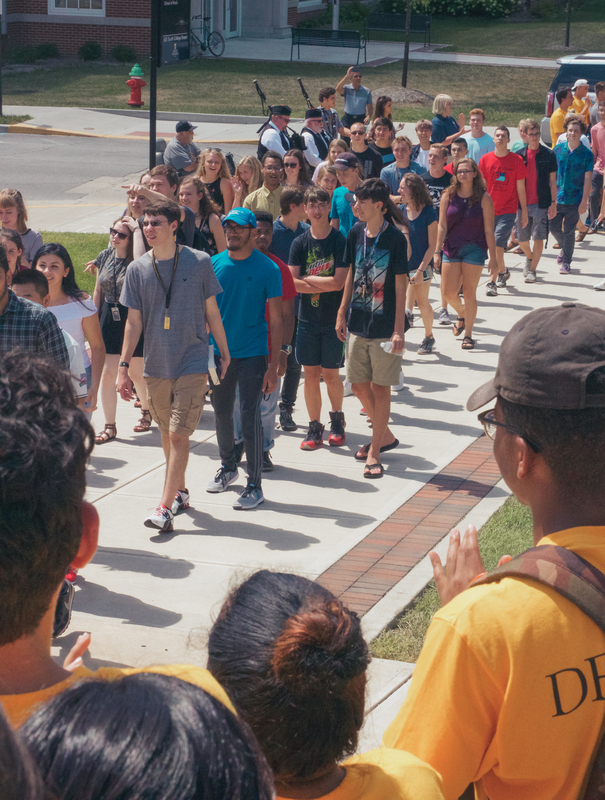 DePauw first-year students walk in opening processional to the convocation of the class of 2021. 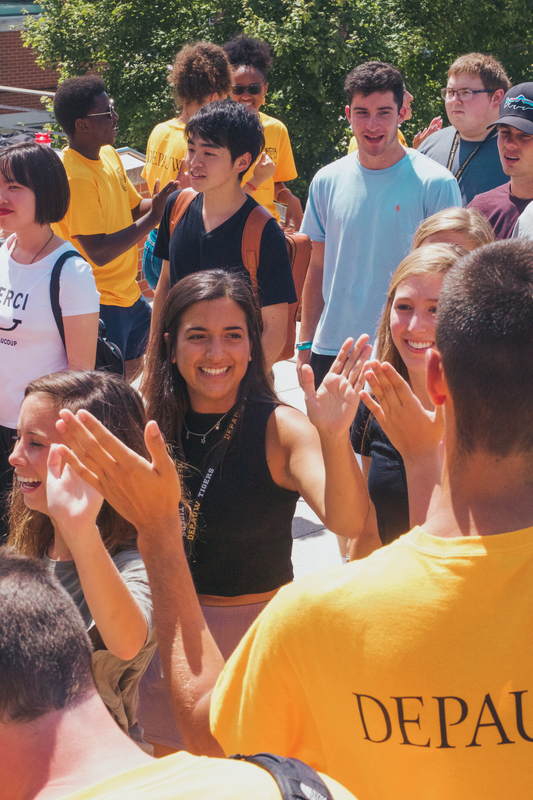 First year students walk to convocation in annual processional where they are greeted by upperclassman. Photo courtesy of Natalie Brunini. 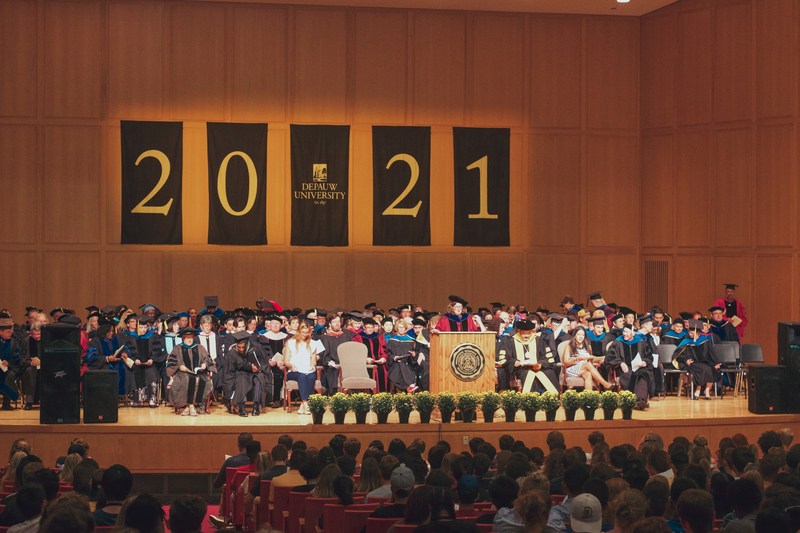 DePauw Student Government student body president, Erika Killion, addresses the first year class of 2021 in annual opening convocation. 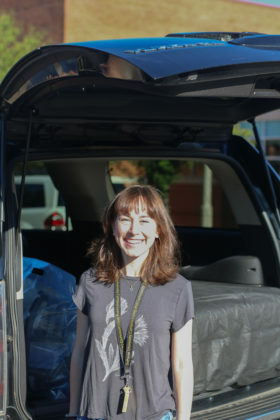 DePauw University first-year student Maggie Ephraim unpacks her car as she moves into her residence hall. Photo courtesy of Natalie Brunini. DePauw University upperclassman wait to greet first-year students of the class of 2021 in annual opening procession through campus. Photo courtesy of Natalie Brunini. 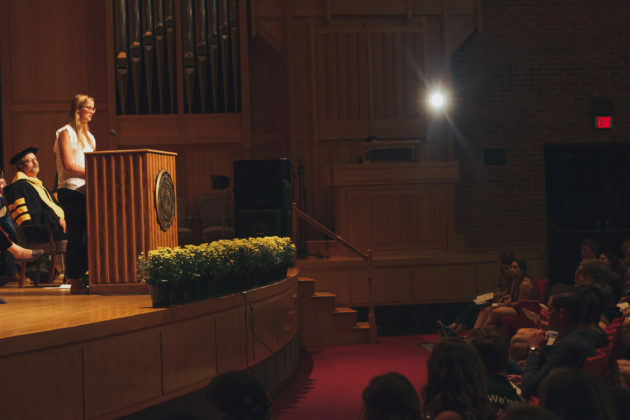 DePauw University's Vice President of Academic Affairs, Anne Harris, addresses the first-year class of 2021 in opening convocation. Photo courtesy of Natalie Brunini. 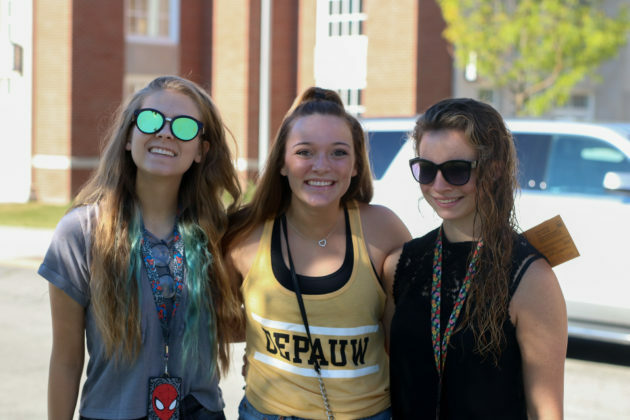 First years Gillian Hughes, Alyssa Fisher and Danielle Adams take a break from moving in to pose for a picture. Photo by Natalie Brunini. DePauw University senior, Diamond McDonald, waits to greet the class of 2021 and helps new students move in.